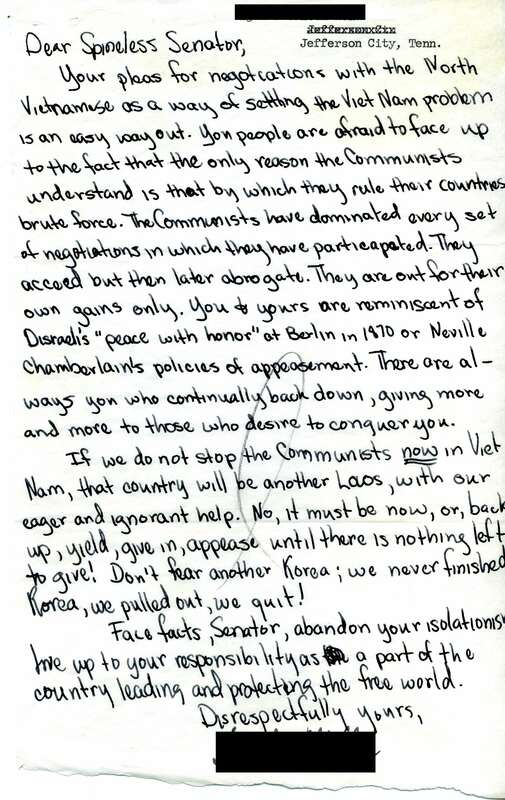 Correspondence from constituent to Senator Albert Gore, Sr. criticizing Gore's efforts to end the conflict in Vietnam, undated. The letter is informal and handwritten on a sheet of unlined notepaper with a torn bottom edge. The letter addresses Gore as "Spineless Senator" and ends with "disrespectfully yours. Circa 1966, it was filed with correspondence from the first months of that year. Gore, Albert, 1907-1998. "Jefferson, Tennessee Resident Letter." Albert Gore Sr. Senate Papers, Issue Mail, Vietnam, 1966, Folder 1, Albert Gore Research Center, Middle Tennessee State University, Murfreesboro, Tennessee. Accessed 19 April 2019. http://acsc.lib.udel.edu/items/show/299.